FOR A COMPANY COMMITTED to sustainable and profitable growth, the forces that threaten to impede or derail your best-laid plans are many. And yet, these forces for change also present opportunities for those agile enough to adjust quickly. The forces that require organizations to rethink growth strategies can be external or internal. The external forces include changing customer requirements, new entrants, intensified competition, new technologies, shifting economic patterns, and mergers and acquisitions. The internal forces can arise from new products, pushing into new markets, changes in business strategy and slippage in company performance. When these forces are upon your business and it is time to take a fresh look at your Growth Strategy, senior teams can delay or become stuck; not because it is impossibly complex, but rather because it falls through the organizational cracks that often exist between the disciplines of business strategy, strategic marketing, and sales strategy. 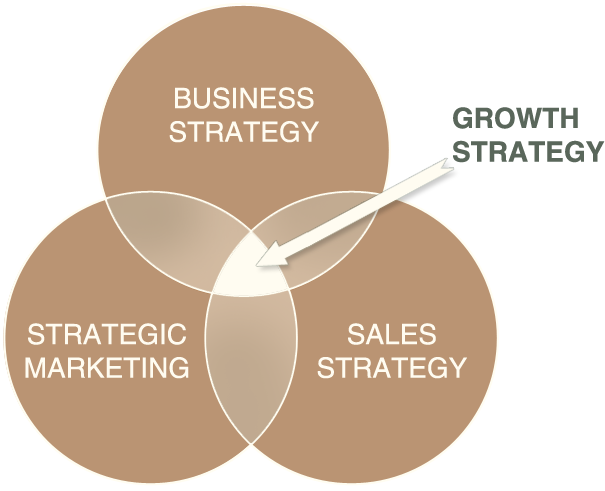 What’s needed is alignment and fit between these three aspects of strategy. Entheon’s Growth Strategy services provide a solid process, a reliable map, proven tools, and a seasoned guide. The result is a bridge that links your business strategy to the ongoing processes and activities that will drive profitable growth for your business. With an actionable growth strategy in place, your team is ready to turn its focus to building or fine-tuning your growth engine.